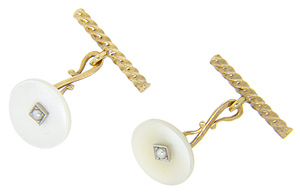 These 14K yellow gold art deco cufflinks are round in shape and each is set with a single white pearl. An ornate “S” link connects the vintage cufflink’s two halves. The discs measure slightly over 14mm in diameter. Circa: 1920.